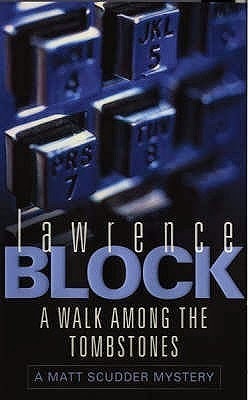 For the last thirty years or so, I've been reading Lawrence Block's Matthew Scudder series which, for me at least, is hands down the best P.I. series that anyone's ever done. I mean no disrespect to authors like Raymond Chandler and Dashiell Hammett, both of whom I admire greatly. But their body of work is relatively small by comparison. Block, on the other hand, created a fantastic character right out of the box, put him in a great, gritty setting, surrounded him with an excellent supporting cast, and then only continued to get better and better, book after book. I normally read one about every four months or so, working my way back through the series in order. But I'd only just worked my way back to the beginning of the series when, suddenly, the release of the movie based on A Walk Among the Tombstones was imminent. I've been reading at a much quicker pace over the last couple of months so that I'd be caught up by Friday when the movie opens at a theater near me, as they say. I confess that I have serious reservations about the whole idea of making a movie from this series. I've studiously avoided seeing the film adaptation of Eight Million Ways to Die, in which Jeff Bridges played Scudder and in which the plot was transferred to L.A., which as any fan of the series could tell you is beyond sacrilegious to the power of about ten. After spending so much time with these books, I have my own very fixed ideas about all the characters, Scudder in particular, and about the setting. And I don't want any movie, no matter how brilliant the people involved, screwing them up. As this book opens, a drug dealer's wife is kidnapped, brutally raped and tortured, then killed and returned to the drug dealer in pieces. The drug dealer is actually a fairly nice guy as drug dealers go, which is to say that he's way up high in the food chain and is not personally peddling crack to small school children. The dealer's brother knows Matt Scudder from AA, and Matt agrees to investigate the case and try to determine who the guilty parties might be. Scudder doggedly pursues the case, as he usually does, doing research and interviewing people who might be able to shed light on the situation. He discovers that the drug dealer's wife was not the first victim of these killers and doubtless won't be the last. But will he be able to close the net around them before they claim another victim? And what will happen if he does? The tension mounts throughout the story, leading to a great climax. But, as always, the character development is key to these stories. The street kid, TJ, who first appeared in the last book, A Ticket to the Boneyard plays a larger role here, as does Matt's main squeeze, Elaine Mardell. Fans of the series know that Elaine is a high-end prostitute that Matt first met back in the days when he was still on the job as a cop. But the relationship has reached something of a critical juncture, and the tension involved in that subplot is almost as great as that in the main plot.